I got the most amazing gift last week from my old friend Mishi Moo Cow (not her real name) in New Zealand. Mishi sent me a lovely 29 year old German woman called Handy Hilde (not her real name either) who’s staying with us for a few weeks while she looks for work in Australia. Hilde has been traveling round New Zealand for 10 months doing what’s called WWOOFing. If you think I’ve either missed my worst typo ever, or finally gone barking mad, think again. WWOOFing has been a real sanity saver for me. That’s a bit of a mouthful for what basically means travelers work on farms in exchange for free food and accommodation. Hilde escaped from fruit picking, which sounds idyllic but is actually hard yakka (an Aussie term for back-breaking labor), by working for Mishi Moo who needed someone to help her clean, paint and prepare her house before selling it. Then, when Hilde was about to hop on the plane for the Australian part of her trip, Mishi asked if I’d like to have her to stay. Why invite a strange traveler to stay with you? I didn’t have any particular work for Hilde to do and we live in a suburban house, not an organic farm, but I liked the idea of a cultural exchange and helping a young traveler. I’ve done more than my fair share of traveling so I know what it’s like to live in hostels eating bad food when you just want to have your own room and eat fresh, healthy food. I’ve also done plenty of odd jobs to finance my travels, from one of the best jobs I’ve ever had to one of the worst. The best job I had to finance my travels was being the English nanny to the loveliest family ever in Connecticut. The worst was lychee picking at a kibbutz in Israel where I had to get up at 3am and endure many long hours out in the field with poorly paid Lebanese workers who threw lychees at me which bounced painfully off my rather wide forehead. They were only trying to be friendly but it wasn’t fun for any of us. So now it was my turn to be the hostess. I hoped I could help Hilde get settled into Australia, get the Candy family on best behavior for our house guest and who knows, maybe share the load of feeding, caring for and cleaning up after the three Candy kids. Hilde turned out to be a gift from the gods. She’s cheerful, independent and keen to repay us for having her to stay by doing just about anything. It’s like having two mums in the house, one of whom is blessed with youthful enthusiasm and endless patience. Why go to stay with a strange family? So far Hilde has sanded and painted some tables to be used as writing or coloring desks in the kids’ bedrooms, helped around the house and cooked us some yummy German dishes including salmon lasagna and pumpkin, coconut and prawn soup. Her meals make a tasty change from the family favorites I rotate on a regular basis ever since I liberated myself from drudgery. Best of all Hilde is happy too because apparently staying with us is much better than some of the hard work she had to endure on some New Zealand farms. Plus we live near the beach, the weather is gorgeous right now and we’re happy to help her get settled in. Hilde speaks great English but I’m helping her improve her pronunciation and grow her vocabulary because I used to be an english teacher so I can’t help myself. The Mucho Man (my hubby) and I don’t have any relatives in Australia so having Hilde staying with us even gave us the opportunity to have a night off and a night out in Brisbane. Yes, we hopped off to the big city leaving the three Candy kids in her more than capable hands. You’ll be able to read more about that soon. Sadly Hilde won’t be with us long as she’s already found a proper job but if it all goes to pot she can come back here anytime. How can you travel free or host a traveler? I’m sure you could find travelers who were interested in doing an exchange of work for food and accommodation in online forums or websites like the Gum Tree (in Australia) or Craig’s List (in the USA), but I can’t imagine doing it without a personal recommendation. I should though, it’s been a great experience for all of us. It’s incredible how just having an extra pair of hands and a smiley face round the house really lightened my load. What I really love is how we all took a risk that turned out to be a win win situation. Mishi couldn’t have sent me a better gift if she’d tried. Would you open your home to a strange traveler? What would you do for the love of travel? Annabel, personal recommendations are ideal by the sounds of it and a great way to host or be hosted. I haven’t tried this before, but will keep it in mind for future travel opportunities. Hi Hari, could be a good one if you travel alone. Can’t imagine doing it with the family! Sure to be some good travel stories in it anyway! Wonderful, this sounds totally win, win, win!!! What’s not to love!!! Hi Se7en, it was! Still loving it right now but it will end soon. Sob! Annabel, there are several online networks your readers can use to list and find extra bedrooms (or sofas) for travelers. The most well established is CouchSurfing.org. I’ve had a good experience with them. Last month, the home of a San Francisco host named EJ was tragically vandalized by a guest. The damage was so bad that her life was turned upside down. When we learned of this our hearts sank. We felt paralyzed, and over the last four weeks, we have really screwed things up. Earlier this week, I wrote a blog post trying to explain the situation, but it didn’t reflect my true feelings. So here we go. There have been a lot of questions swirling around, and I would like to apologize and set the record straight in my own words. In the last few days we have had a crash course in crisis management. I hope this can be a valuable lesson to other businesses about what not to do in a time of crisis, and why you should always uphold your values and trust your instincts. With regards to EJ, we let her down, and for that we are very sorry. We should have responded faster, communicated more sensitively, and taken more decisive action to make sure she felt safe and secure. But we weren’t prepared for the crisis and we dropped the ball. Now we’re dealing with the consequences. In working with the San Francisco Police Department, we are happy to say a suspect is now in custody. Even so, we realize that we have disappointed the community. To EJ, and all the other hosts who have had bad experiences, we know you deserve better from us. My point here is that yes, “couch surfing” and hosting are likely to be rewarding experiences but travelers and hosts alike should be prepared the encounter the good, the bad, and the ugly. Hi Wryter, thanks for sharing this and joining us here. I just read Couchsurfing by Brian Thacker before being given this opportunity so I think that influenced me! The story you share is terrible and yes, everyone has to be aware of the risks. I guess that story is one bad incident in many thousands of good ones but definitely a wake up call. It reminds me of my hitchhiking story (https://www.getinthehotspot.com/kindness-strangers/) and how so many people don’t pick up hitchhikers because of the risks. Couchsurfing sounds better managed as hosts and visitors can be rated so they have references, much like those you check out before buying something from an Ebay seller. Enjoy Mexico:) I hope to see you back here soon! Good story as always Annabel! A few years ago my daughter (then aged about 17) announced we were expecting a guest called Oliver from Germany for a few days (!). I knew she’d met this person here and they were exchanging letters and photos and he seemed like a lovely guy… and because I love travel and get just as much joy meeting a traveller as being one, I thought sure, why not. It turned out that our guest was a different Oliver from Germany, a complete stranger and he was coming as a couch surfer! I was given a brief overview of couch surfing and though dubious, I thought (since he was already on his way) I would give it a go. Of course he needed collecting and of course I needed to do the driving and it happened to be midnight when he was arriving in town and of course he didn’t turn up. We waited at the station for about an hour then turned around to come home. She was very disappointed and I thought ‘well there’s the proof that these things just don’t work! Halfway home, he rang, saying he had arrived … in that moment I tossed up with doing the predictable adult/mother thing (‘no way, enough is enough he can fend for himself!’) or heading back into the city, which is what we did. He turned out to be a gorgeous boy, polite, kind and interesting. He was supposed to stay three days (as per couch surfing conditions) but ended up staying a week, after which I needed my routine back and it was time to go. We helped him settle into accommodation nearer to university which was why he had come here and were happy to have been able to help a young man find his feet in unknown territory. Wow, that makes me want to try couch surfing! You were an angel. I wonder what I’ll do if my kids start announcing similar things:) Do you still keep in touch? All in the spirit of adventure! Haven’t heard anything from Oliver though that’s to be expected – people move on and away. I used to think it was important to maintain contacts but am happy to look on these experiences as in-the-moment and unique. You don’t necessarily have much in common with the people you meet along the way (we once spent some time in Bali with a couple of French police commissioners who were travelling around the world with their two small children) but it’s great fun sharing stories over a glass of wine and finding out about other people and how they think. Wouldn’t Hilde like to spend a few weeks in Sydney? I’m sure she would – send her to us!! I’ve had au pairs in the past which, like life, was a mixed experience, but lots of good parts there and great for the kids. If hubby starts lots of travelling again I will be trying to get some young spare pairs of hands for a month at a time. Personal recommendations are always the best of course; Hilde we’re waiting! Hi Seana, I am telling her how lovely you are:) Not sure if she’ll go to Sydney but if she does it could happen! My brother used to send up au pairs to us from where he was living in France, to us (with two small children) in Wales with mixed results! But the best I found were the boys! So the following summer we had another teenage boy come to stay who was a dream – entertaining the children, helping around the house… We’re still in touch – He’s now married with 3 of his own! Hi Marquita, great to see you here. Ah yes, this is the problem with living in a prime holiday destination:) So does that mean I can’t come to visit you then?! Hi Teresa, ah, but with a new baby you probably need help more than any of us! We had two exchange students from Japan once when my sons were little. They attended the local college and in a way I enjoyed it, however, it was more work at home because they paid for room and board. So I guess, this was a different situation than Hilde’s. Now I wouldn’t mind having a student from another country. Yes, that’s another option you can take up here in Noosa where there are a few students studying english but yes, in that case it’s another child (or 2 in your case!) in the house, not another mum! We’ve had au pairs in the past, but with mixed results and it ended up costing more than child care once you factored in the expense of keeping them plus paying them. This sounds like a much more fun option, where it’s just (new) friends helping each other for as long as it lasts. I’d love a Hilde! So sorry Hilde got a job. I was about to say: Send her up here to Doonan when she wants a change! Incidentally, sorry I missed introducing myself at the recent nonfiction festival in Cooroy. I was busy as a volunteer while you were workshopping. Hope to meet up one day soon. There can’t be that many other ex-Yanks living hereabouts and blogging about it. What a great thing to do. I grew up on a 88 acre produce farm and worked in the fields and farmers market beginning at age 5. All day long. It was hard!! Oh and we use to throw tomatoes at each other. Must come from all the boredom of long hours looking back! A few years ago when hubs lost his job we actually looked into WWOOFing! Because I thought it sounded fun;) Hubs found another job and we never went. I still think it would be fun especially in NZ! Hi Annabel, volunteering like this is a great idea. Not only it helps you to cut down on expenses but also gives you a chance to experience local cultures and ways of life. I would suggest you check out volunteerstays.com it is for people who love to travel and want a local experience with hosts in different countries. 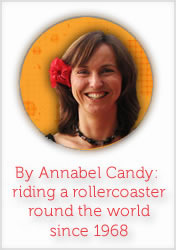 Love the storytelling in this post Annabel. I love travel and would be interested in trying this. Sounds both fun and memorable.